Returning to London with a new show, Siro-A continue to phenomenally push the boundaries of technology and theatre, taking them beyond the standard that they themselves trail-blazed. A miming, clowning, magic, acrobatic, and visual spectacular at the forefront of theatre technology, humour, and imagination. Siro-A is like nothing you’ll have seen before. Even their tag-line of being “Japan’s answer to the Blue Man Group” doesn’t really do them any justice. This “technodelic entertainment” venture is all about combining lights, sound, images, and physical performance into a show that defies imagination and dazzles the senses. Essentially an exhilarating digital circus, they’ve met with rave reviews across the globe. Indeed, this time last year saw me gushing over their previous show, with a glowing 5* endorsement. So, already knowing just how good they are, the question for me was how they would be able to better the extraordinary bar they had set last year. Thankfully, they’ve managed to outdo themselves, even managing to produce a show that contains a majority of brand spanking new content. Whilst toying with 3D projections still forms the basis of the show, where Siro-A have outdone themselves is by excelling in experimenting with new mediums that weren’t in their last production. Particularly, there is are whole segments that utilises live video and video looping and modulation techniques. Their approach to these segments carries the same magnificent sense of invention and creativity that is inherent in everything that they do. Even though breaking new ground, it’s just as exciting as and meticulously executed as their tried and tested material and are as surprising and as astonishing as everything else. Furthermore, there is a wonderful balance between humour and aesthetics. The more comic segments are wonderfully wry, such as the typographical/Bretchian treatment of popular films that’s an absolute hoot, as well as a face-pace and tongue-in-check montage of Japanese culture that’s as if Terry Gilliam had worked with the Osaka Tourist Board. But there are also moments of sheer beauty and high-aestheticism that are literally awesome and stupendously arresting. “Peacock” is an exquisite rainbow-clad ballet that is as mind-bogglingly kaleidoscopic as it is sumptuously psychedelic. Whilst I’m aware that my usual format deals with two elements individually, for this show it’s really difficult to separate them. Given the rigid technicality of the show, everything about what’s done on stage, from Daichi Norikane’s video and Kentaro Homma’s music to the cast’s movement and electronic interplay, has to be precise and meticulously executed. Without a complete harmony between all these elements, nothing would work or come off effectively. Yet despite the huge margin for error, Siro-A pulls off a miraculously slick concord. The only criticism that I could possibly give is that it’s impossible to get it right 100% of the time. A box might be narrowly an inch to far to the left or right, making you notice just how exact the entire production needs to be. Given that they don’t have the grace of a larger venue to make these less noticeable (something which I picked up on with their last show), their herculean effort is as close to perfection as you’re ever going to get, getting it right at least 97% (if not more) of the time. The cast are also a lot more athletic and energetic, adding high octane acrobatics into segments old and new to keep the adrenaline pumping and audience’s jaws permanently on the floor. Given just how precise every single movement has to be in the show, you quickly find that Keiji Miya, Fumiya, Yohei, and Toshiya Arai are all unreasonably gifted physical performers of the highest pedigree. 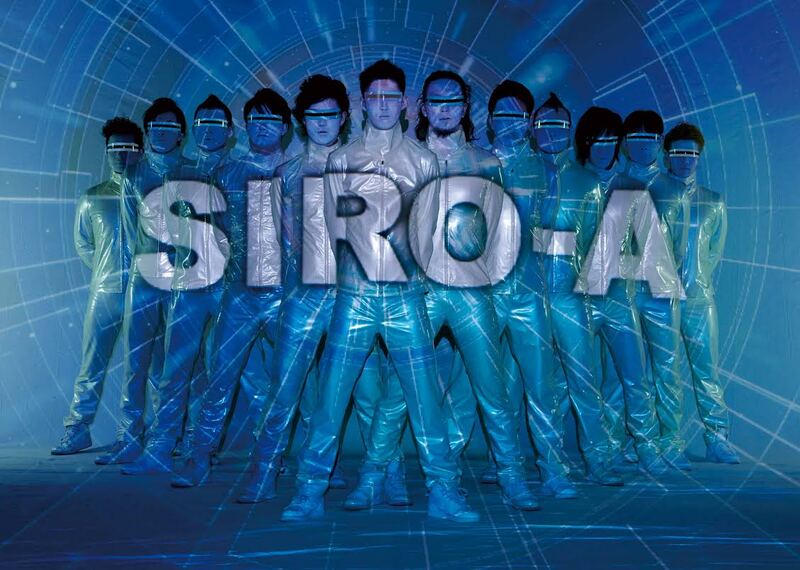 As well as reaching out to incorporate new electric mediums, the Siro-A troupe have incorporated more interactive segments with the audience too. Whilst it might seem like the usual slightly awkward audience participation skit that you find in family shows, it’s a marvellous surprise to find that all of it is used and inputted into the technology of the show itself, making it joyously far more than meets the eye and making you a part of their world. But the real joy is that the result of the show on a whole is how it obliterates the line between reality and virtual reality as you end up being unable to figure out where the tangible ends and the technological beings. It’s as if GameBoy cartridges were illicit drugs: exciting, audacious, and perception-bending. Adults and kids alike cannot failed to be wowed by this astonishing extravaganza. Literally awesome, and proof that magic still exists in a digitally mundane world. Siro-A plays at the Leicester Square Theatre, WC2H 7BX, until 11 January 2015. Tickets are £20 (concession and family tickets available). To book, visit http://leicestersquaretheatre.com. For more information about the group, check out their official YouTube channel.